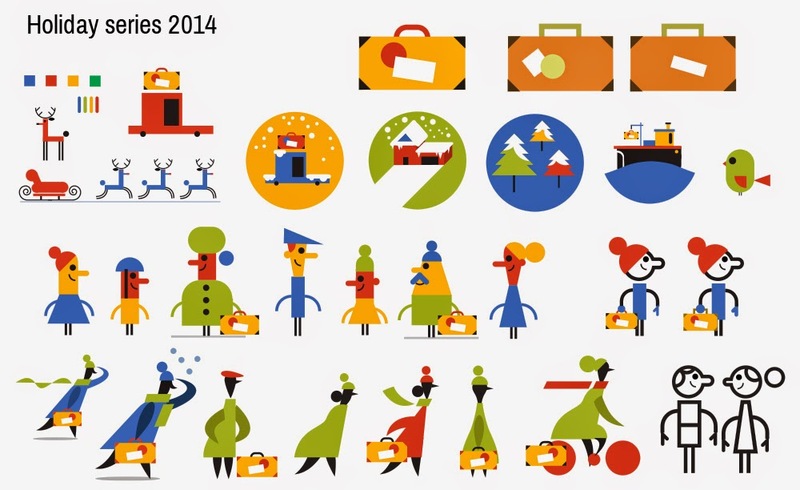 Holidays 2014 - A short film. Holidays almost always involve travel and transport, and I wanted to celebrate the variety of ways we do this. Choosing a suitcase/backpack motif, I set about creating multiple people that transform and adapt to their surroundings. It's a "door to door journey" seen through many eyes. Whatever our destination this holiday- a snowy mountain, a perfect wave or a crackling fire, we hope you enjoy the ride! The music is "Seabird" by Matt Saxton. Below are initial designs and test animation, props built in 3d and looped gifs of some of the characters. The film is HERE. Looped gif for day 2 of the holiday season.